Ok, I’m rarely good at introductions…and let me tell you, the blank page looms large at a moment like this. How to introduce this writing project without being so general that I wind up saying nothing (i.e. “this is my journal, it will contain my thoughts and experiences” well, yeah…) or so specific as to put myself in a box that quickly becomes confining. I mean, I could be writing here for years…or at least I hope so. First, the short and sweet version. 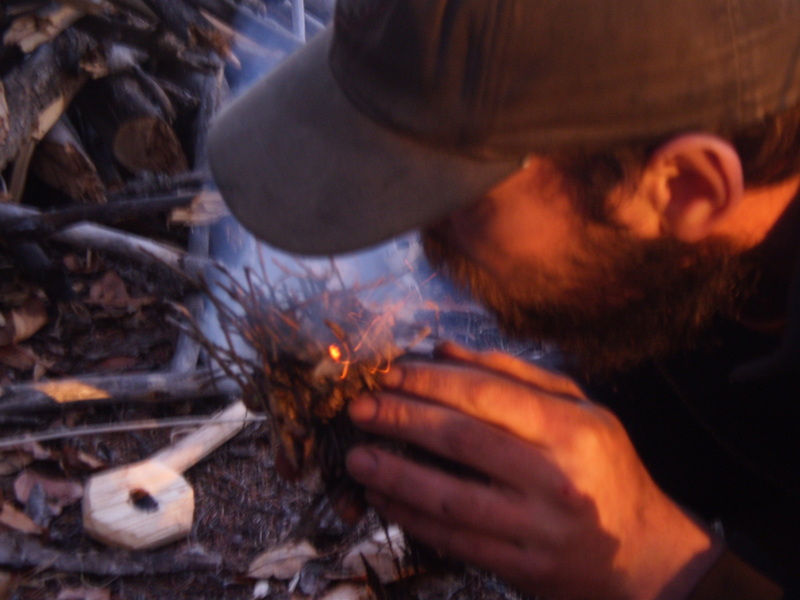 What you’ll find here are essays on modern bushcraft, primitive skills, nature awareness, and my own personal philosophy of primitivism (including constructive critiques of “modern” life). Overall, this online journal is meant to be an exploration in the way of seeing and relating to the world that some call “primitivism”, especially my own personal version, which I call “practical primitivism”. You might also call it “lifestyle primitivism”. As far as I know, at this moment, the total number of people using this label is exactly me. Though, the number of people who are of a primal mind and a practical disposition is probably countless. I use the label to contrast my own perspective with other writers who call themselves “primitivists” (likely less than a hundred people worldwide…so it’s very important that we’re clear on this! ), and to focus on a key priority of mine — how “primitivism” can be practical. How it can be lived in the world, here and now. The following essays give a pretty good idea of where I’m coming from: How can primitivism be practical?, “Practical Primitivist: So what does that mean?, The bias I share with Tyler Durden and Why it might be scary if life is good. But I’d say the most useful thing I’ve ever written is: My #1 primitive survival tool: the rock in my pocket. In addition to my own musings and (mis)adventures, I may write some flat-out fiction. I’ve often fantasized about being a writer of stories, and I may indulge that impulse from time to time. Hopefully I’ll make it obvious what are my own highly biased experiences vs. what is flat-out-fiction, but if not, at least know that I aim to write some damn-realistic fiction. I’ll at least promise that mistaking the occasional fiction for fact won’t get anyone seriously hurt…which, I figure, is more than some fundamentalist Christians or over zealous Tom-Brownies can say. Anyway, that’s my introduction and I’m sticking to it. Hope you enjoy entering my world. P.s. That guy in the picture blowing a coal into flame isn’t me. It’s my buddy David Jonas — a fellow far more talented in terms of primitive living than I. I’m the one standing behind the camera. I’ll definitely be reading this Uncle Glenn! Would love to hear about your adventures and your thoughts. I’d like to be able to speak with you more than we actually get to because I really enjoy your insight and open mind. I look forward to reading your online journal! Good luck brother. Should be interesting. Ahhh! RedWolf Returns yet again. Very good. Good for you Glenn! I miss talking with you, but this will be a great way to stay in touch. Damnit! Another rewilding blog I have to read. I’m never gonna actually get outside and “practice” my primitivism at this rate. Seriously though, I look forward to following your blog. Also, I think you might be selling us primitivists short when it comes to our numbers. I’d be surprised if the actual and completely unobtainable figure was under a couple thousand. And you’re probably right about me underestimating the number of primitivists out there Gabe, I think a lot of people who live the philosophy don’t use the label. Anyway, I made a slight change to my intro now to reflect that…thanks for helping me put things in better perspective. Hello glenn, I am a 23 college student who is majoring in Philosophy. I have resently been writing about something that you touched on in your article about primative happiness. Nothing I have been able to find comes closer than what you articulated so well in that article. I would love to get in contact with you, an perhaps trade some thoughts. If you indeed have the time, it would truly be my pleasure to discuss with you. Feel free to email me at ghelkenn@hotmail.com Cam. Maybe we can set up a time to talk on the phone.